Looks like my trade caught a bit of bad luck as the Federal Reserve unexpected bails out AIG shortly after I posted my trade idea. Risk tolerance grew and carry trades rallied, pushing up EUR/CHF higher during the European trading session. My trade was closed out with a small loss. So, this was a case of unexpected fundies blowing technicals out of the water. It happens, which is why stops are a great insurance tool to have when we turn out to be wrong. On to the next trade! Greetings Forex compatriots! 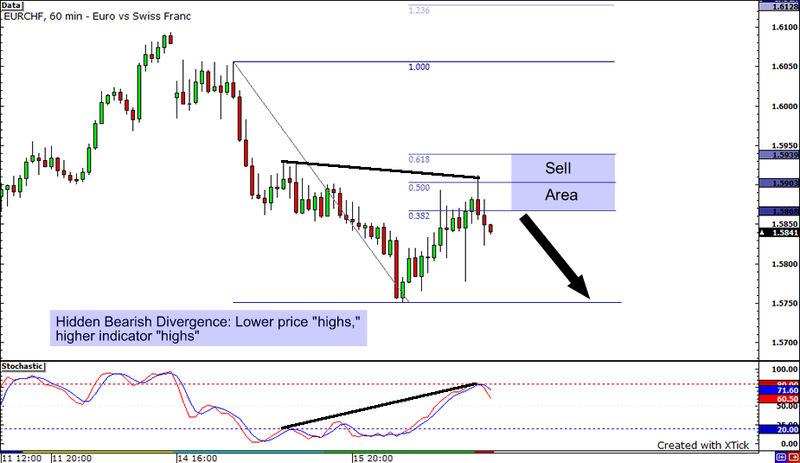 There’s a Fibonacci play forming on EUR/CHF that I would like to share today. It looks like the market is giving traders another chance to jump into the downtrend. Let’s take a look…. I have prepared a one hour chart, and after taking a quick look on the higher time frames I can see the pair is still in a downtrend and currently retracing. Looks like it reached as high as the 50% Fibonacci retracement level. Also, we have a signal of hidden bearish divergence as the shows lower ‘highs’ in price, while giving us higher ‘highs’ on the stochastics. Stochastics are also showing the pair has hit overbought conditions when it reached that 50% retracement area. Before we go into what I plan to do, I took a quick look at the upcoming events and it looks like there’s no major events for either the Euro or Swissy, so tomorrow’s price action may be dictated by risk tolerance.